My dad is an amazing gardener. Growing up, he grew pretty much all the veggies that we ate. If I had to guess, probably 2 acres of our land was a giant garden. In retrospect, I wish I had appreciated it a bit more. But at the time, all I knew was I hated shucking corn and shelling beans. And that it really smelled up the house when my mom made and canned pickles. These days, however, I'm grateful for his expertise. When I wanted to plant my own garden a few years ago, I immediately sought his advice. And his advice was to start with tomatoes and herbs. So I've been doing the container garden thing on our back deck for the past few years, with moderate success. My tomatoes never get very big, but my herbs usually do alright. This year, I decided to skip the tomatoes, since I can get plenty at the farmer's market. And I wanted to do something cute with my herbs. As an aside, my dad would probably be mortified to know that I said that. He doesn't like "cute." 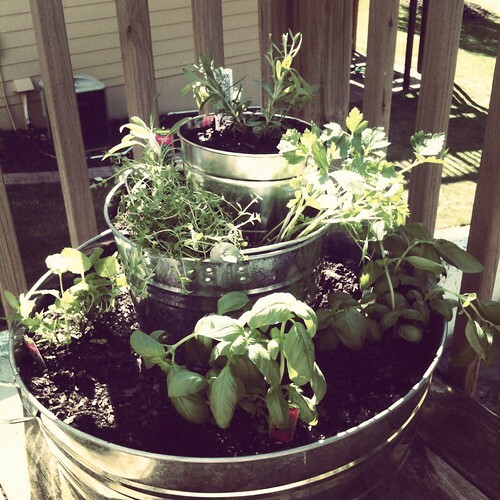 Thanks to the wonder of pinterest, I came across an idea to do a tiered herb garden using galvanized tubs. I drilled several holes into the bottom of each tub to allow the water to drain, and then filled them with potting soil, planted my herbs, and stacked them up. I bought everything I needed from Lowe's, but I'm sure you could also find the supplies at Home Depot or any other hardware store. I bought three tubs - the largest one is about 2 feet across, the middle one is about 1 foot, and the smallest is 7 inches. At first I looked in the gardening section, but I eventually found the tubs in the paint section. I already have chives and oregano in other pots, otherwise I would have planted those as well (or in place of something else). Amazingly, everything is totally flourishing, and at this point, I have more herbs than I will know what to do with. I think I may actually need to move the basil to its own pot? 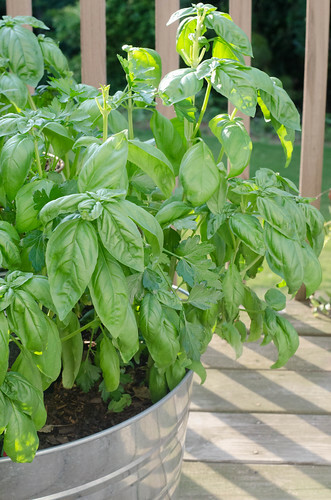 With Memorial Day weekend coming up, it's a great time to plant some herbs if you haven't already. This project took me less than an hour, and that was with Caroline "helping" me. I absolutely love cooking with fresh herbs, and now I have pretty much anything I'd want at my disposal. 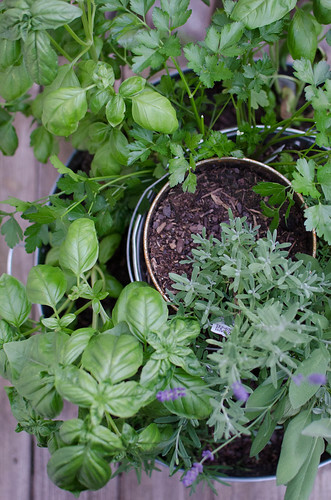 Are you planting a garden this year, and if so, what are you planting? I may give in and plant a few tomato plants after all, or perhaps some jalapeños or zucchini. I love this! I was looking at herbs at the store today but didn't want to buy any of the ugly pots they had. I hope I can find my husband's drill so I can do this! This IS cute! What a great job! I love this idea. 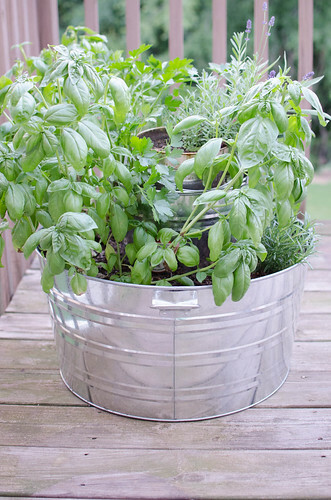 I just have a few pots with various herbs in them, I love this idea so much more. Plus it also serves as "decoration"! Thanks for sharing! Way to go - and you can always make pesto and freeze it in ice cube trays so that all winter long you will have fresh pesto!